UNITED NATIONS, July 21, updated -- The day after Al Shabaab in Somalia attacked and targeted for expulsion three UN system agencies, specifically excluding other UN agencies from the ban, the UN put out a statement on July 21 that 'the Secretary General condemns the looting yesterday of UN offices in Somalia [which] target the whole gamut of UN peace and humanitarian operations in Somalia." While the UN and Ban Ki-moon might wish the statement were true, it is dubious. Al Shabaab, as they did in earlier attacks on the UN Development Program, picked a particular part and approach of the UN system. UNDP was the middle man for unnamed, largely European and former colonialist funders of the armed forces, with questionable human rights records, which defended the Transitional Federal Government..
By contrast, as Inner City Press asked and wrote about last week, the UN World Food Program recently met with Al Shabaab, seemingly connected to WFP staying in the country. UNDP will say, as its paid defenders have, that it takes sides in this civil war and chooses the TFG because it is entity the UN helped set up. But with so many of its parliamentarians not even living in Somalia, the TFG's credibility is questionable. And UNDP insiders tell Inner City Press that UNDP's reason for siding with the TFG is not unrelated to the fact that UNDP had make fees as middleman on funding to the TFG, while Al Shabaab is not getting, or even asking, for international aid. Perhaps there are legitimate reasons why one part of the UN system -- in this case, UNDP, Ould Abdallah's UNPOS and Department of Safety and Security -- takes sides in a civil war and get thrown out of the country, while another part (WFP, UNICEF and others) speaks with both sides and stays in. A debate on these two approaches might be helpful. Instead, the UN rushes out a blurry statement which is inaccurate on its face, and expects that nothing will be said. It is time for UNDP and its no longer so new Executive Director Helen Clark to come and take Press questions. There are been developments with regard to UNDP's involvement in diamond mining in Zimbabwe, and over-compensation of consultants. Written questions put to UNDP have been pending for months. Watch this site. 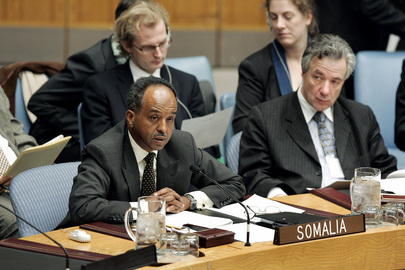 UNITED NATIONS, March 24 -- Optimism about Somalia is a new trend in and around the in UN in New York. Days after the country's new foreign minister -- himself British -- told the Press outside the Security Council that one month of receipts from the Mogadishu port portends well for the paychecks of the Transitional Federal Government's ever multiplying number of parliamentarians, the International Peace Institute presented two experts, both upbeat about the negotiations in Djibouti and the UN which sponsored them. As at the Council, however, no one would say how much the UN paid, from or to whom. IPI's two presenters, Ken Menkhaus of Davidson College and Somali expert Jabril Abdulle, both said that the Shabaab rebels are on the run, the port is in government hands and the future is rosy. Inner City Press asked for an assessment of the performance of UN envoy Ahmedou Ould Abdallah and the UN's Group of Experts on sanctions. The former called for a moratorium on reporting from Somalia; the later reported a few years ago that Somali militants were in South Lebanon for training, which made more Somali-watchers laugh. Menkhaus defended the Group of Experts recent work, dismissing the Lebanon error -- circa 2006 -- as "in the distant past." He did, however, sound a cautionary note about the role of the UN Development Program, which he said has been paying the salaries of security forces in Somalia. Abdulle added that the UN paid to transport the bloated Somali TFG contingent from Djibouti to Mogadishu. On Friday, Inner City Press' question to Ould Abdallah about what the UN pays for in Somalia was referred, through his spokesperson Susie Price, to UNDP. Four days after promising an answer, UNDP has still not answered. 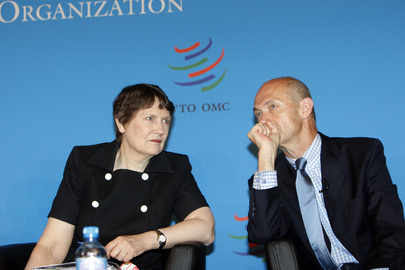 Menkhaus noted the attack on UNDP last year, and said the agency is perceived as taking sides. Perhaps this partiality is mirrored in an unwillingness to provide basic financial information about what it spends in Somalia, and on what. Footnote: The head of IPI, Terje Roed Larsen, was not in attendance on Tuesday. Inner City Press has asked UN spokespeople for reaction to Syria's critique of Roed Larsen as exceeding him mandate as UN envoy under Security Council resolution 1559. Roed Larsen is also one of the most senior UN officials who has rebuffed Ban Ki-moon's call to make basic public financial disclosure. Now, Roed Larsen's wife Mona Juul is rumored as a closed but failed candidate for the vacant Assistant Secretary General post in the UN Department of Political Affairs vacated by Angela Kane. The post, sources say, is slated for UNDP's previous Middle East operative, Oscar Fernandez Taranco, well imbued in UNDP's culture. We'll see.